The article below was a collaborative piece, and is worth repeating. It is important on 2 fronts. Firstly it shows how your local paper can work with it’s community. Whilst it does not mention in detail, Chris has had a great deal of help and support including the offer of a start up loan from the start up loans scheme for 18-30 year olds. I have every confidence he will be a massive success. Ring 01253477147 , C/o Get Started, FYCreatives, 154 Church Street, Blackpool, or contact me via LinkedIn. We need 50 Mentors to assist our young Entrepreneurs in Blackpool. In business! Give something back. AN animator, nominated for an Oscar has set up his business in Blackpool. Chris Gough, who worked on the Academy Awards nominated, Pirates in an Adventure with Scientists movie, and on the current BBC series of Shaun the Sheep has launched Ghost Light Workshop. He specialises in stop-motion animation, the kind that made Wallace and Gromit creator Nick Park famous. He works with armatures, the metal frame inside the clay figures which allows them to be posed for the camera, and with rigging, metal supports which allow the characters to jump and fly on film. Chris, 30, from Marton, had struggled to find a suitable workshop but Blackpool Council has stepped in to offer him space at the huge Illuminations department building. The stop motion industry is said to be worth around £200m at the moment, and the council hopes Chris’s success will help spark the local economy and inspire others to follow in his footsteps. 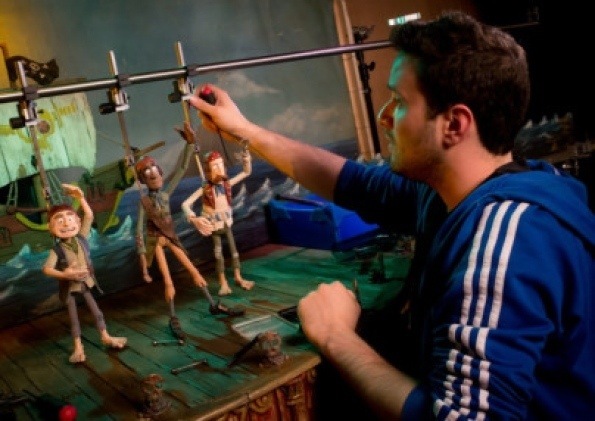 Chris, who also worked on Aardman’s short films for the Olympics, said: “I did the work on the rigging for Pirates, which helps to create the effect of the animations flying or jumping. “It was a small team so you could be really hands on and get involved with most shots. “It would have been really cool to have won an Oscar for that film but never mind. “I just love working in stop motion, but the jobs are still quite specific and you have to move around a bit for the work. And so after a summer stint at Aardman in Bristol working on Shaun the Sheep he returned to Blackpool to be with his partner Heather and to set up Ghost Light Workshop. He said: “I want to set up a local base that I can work from and see where things develop. Rather than working for a company, I am now able to concentrate on exactly what I want to do. With help from Blackpool Council and Start Up Lancashire, Chris has been able to access the Government funds to help young people become entrepreneurs, as well as writing up business plans and finding contracts. “The Get Started scheme has been amazing – I couldn’t have done it without them. Coun Gary Coleman, Cabinet Member for Regeneration and Urban Development said: “Chris’s background is absolutely fantastic – he has a proven skill and record in the stop motion industry. “When we heard that he was looking to start up his own company, we were only too happy to help and give him all the advice we could to help him become a success.